I’ve purchased my first snowblower (Ariens 921030) after reading your site. Do you have any links, or any lists, that I could view that would suggest accessories, fuel additives, maintenance items a first time user/buyer should be purchase? I want to be prepared for the winter and any help or direction you provide would be much appreciated. Shear pins for MTD built snow blowers (Troy-Bilt, Craftsman, Cub Cadet) are all the same EXCEPT the 33 and 45 inch snow blowers (also the 900 series 30 inch Cub Cadet) MTD shear bolts are for tractor mounted snow blowers. Husqvarna, Mcculloch, Poulan, Poulan Pro, Brute, Murray, Simplicity, Snapper, Briggs & Stratton all use the same shear bolt. With the Ariens you won’t need belts right now. Your belts should last you 5 years or longer. I use SEA FOAM fuel stabilizer. I put 2 tablespoons per gallon in my gas can when I go buy my fuel. You are welcome to use any brand but if you can – use one with a moisture absorber. If you want to change your oil after the first 5 hours, I recommend that you do. Use what the manual lists or 5W30 synthetic. I’ve been using Mobil One for years. Be sure to adjust you skid shoes so there is about 1/8 inch of clearance under the scraper bar (the bottom of the blower housing) this will keep the snow blower from hanging up on cracks in your sidewalks and keep it from wearing. Make the gap a little higher if you are blowing snow on gravel. Many people keep and extra spark plug around but I don’t. I use the Sea Foam, a good sealed gas can and I don’t have problems with fouled plugs. I usually change the spark plug every 3-4 years. After you use it for 30 minutes the first time, look it over and make sure all the bolts are tight and clips, etc are in place. After that check it every 5 hours or so. Snow blowers are mechanical devices and every once in a while something will rattle loose. I finally pulled the trigger and got the snow blower at top of your top 20 list, the Toro Power Max 826 OXE model 37797 (with the larger tires). I have 3 questions. First, I plan on using TruFuel to run my Toro. I know it’s way more expensive than regular gasoline but I figured that using TruFuel will help it last longer. Is there any reason why I shouldn’t use TruFuel (other than cost)? Second, I’m assuming that you only need to use Sea Foam with gasoline from the gas station (not with ethanol free gas like TruFuel). Is that correct? Lastly, the Toro came with metal skid shoes. I’m going to use it on sidewalks and a cement driveway. Do you recommend swapping them out for poly skid shoes? To summarize here are the 3 questions. 1) Is there any reason not use TruFuel all the time? 2) Is Sea Foam only supposed to be use with gasoline? 3) Do you recommend installing poly skid shoes? Hi Sam, Thanks for making your question easy to answer! 1) Is there any reason not use TruFuel all the time? No, TruFuel will not hurt your engine or carburetor or fuel system in any way. It has the correct octane rating for your engine so it will run well. It has a shelf life of at least two years and I’ve had engines sitting around here with the same TruFuel for over 4 years. They start right up. I do suggest that you fill the fuel tank up full with the Trufuel before you put the snow blower or lawn mower away and especially when you put it into storage for the offseason. This will keep condensation from forming inside the tank. 2) Is Sea Foam only supposed to be used with gasoline? Yes, you can use it in the TruFuel. On an older snow blower, an extra dose of Sea Foam fixes most carb issues. I’ve poured it down the carb throat on a running engine and it cleans it right out. Here is what I usually wrote about Stabil. Sea Foam and Trufuel. Stabil is a fuel stabilizer that you add to the regular gas that you buy at the local gas station. Regular gas, especially ethanol blended fuels (E10) will start to go bad after only 30 days and Stabil helps to make them last longer. Follow the mixing directions on the bottle and put it right into your storage container when you go buy fuel. If you use Stabil always keep your fuel tank on your snow blower full when you store the snow blower for more than a few weeks. Stabil is a brand and they also make a bunch of fuel treatments for long-term storage around water (Marine) and a solution with an engine treatment. Sea Foam is an engine treatment that I use and also works well as a fuel stabilizer. You also add it to the regular gas that you buy at the local gas station at the rate of 2 tablespoons (one ounce) per gallon. It helps to keep the fuel from going bad and keeps your engine clean. I’ve been using Sea Foam for years and my equipment always starts. TrueFuel and VP Racing Fuel is a fuel replacement. 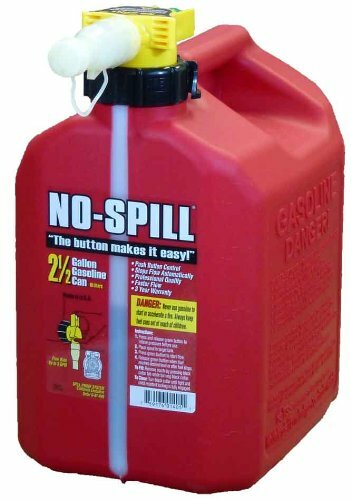 Instead of buying gas at your local gas station you buy this in a quart or gallon can at your local hardware or home center. (Cheapest price I’ve found is Menards.) It is a true ethanol free fuel without any additives and will stay good for up to two years. It’s very expensive (about $20 a gallon) and I use it in engines that I don’t use very often. For example, I have a power brush that I only use about 1 hour a year and a push lawn mower that I only use for trimming about once a month. I use Trufuel in them because it doesn’t go bad. TruFuel also makes 40:1 and 50:1 2-cycle fuels for chainsaws and leaf blowers. I’m planning on running the Seafood from a sealed gas can and do the initial oil change after 5 hours like you recommend. I do plan on running synthetic, however doesn’t that first five hours need to be conventional oil? I know with cars, you need to run conventional for a few hundred miles because the slight amount of wear is required for rings and valves to properly seat. I have a mechanic friend that pulled a motor apart at 50,000 miles as the motor never developed proper power and it was run on synthetic since day one. He said he could see the original machining still in the cylinders as the rings never sat properly, which is a testament to how good synthetic actually is. The answer was to put the motor back together, run conventional oil for a few hundred miles, and then switch back to synthetic. The motor then delivered the power it should have had all along. So does 5 hours with a quality conventional oil and then an oil and filter change to synthetic sound like a good plan for a small motor as well? Hi Paul, I forgot to mention. The engine comes with oil in it already from the factory. Just run that oil for the first 5 hours. At 5 hours or so then you can put in the Synthetic. Do you like to run synthetic oil? I usually run my new lawn eq for about 3 hrs then change to synthetic oil and go the whole season. Am I wasting money? it costs less than $5 a year more to use synthetic oil I was told by my brother you not synthetic oil in small eng like this. @mpcny, It would be interesting to find out where your brother heard that “fact.” You shouldn’t mix regular or synthetic, and even that fact is not that important as it used to be. Many of the new engines are now coming with synthetic oil in them. I’ve been using Mobil One in all my gas engines since the early 90’s. 10W30 or 10W40 for summer, 5W30 for winter. I run autos 300-450,000 miles and I have snow blower engines that are 25 years old. I also used it in all my equipment when I owned the landscape company and never had an engine failure. I hear of lawn tractors engines breaking the crankshaft and throwing parts out the side of the block. I hear of mowers and snow blowers that blow black smoke because the piston rings are shot. I’ve never had any of those problems using synthetic oil. .